"Mario was very professional and did a great job at solving my problem "
"This was the second service call for me. I called the night before after hours not expecting to speak with a person and they picked up. 24/7! They came by the next morning and installed a new bracket at the top of the door, new springs, and new cables. My original door was installed 18 years ago. It works great, and I know it will for another 18 years. Josh did a terrific job, on time and very friendly and professional. Great company. 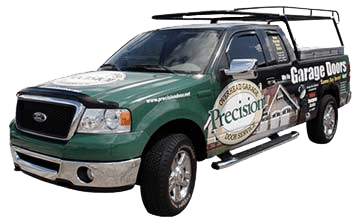 I will highly recommend Precision Door Service!" 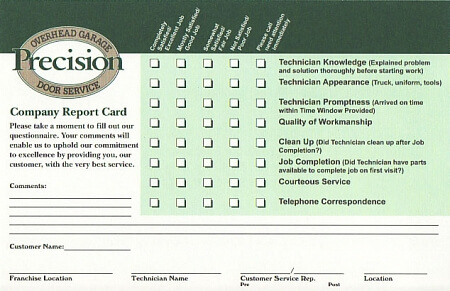 " I am always very happy with precision garage door services. They are very prompt in their arrival time. The service repair person was very nice and informative "
"Service preformed on my door springs in a timely and efficient manner. The tech arrived on time and was very informative. Haziel did a great job.Would refer this company to friends if they need repairs." "Mario was professional and courteous . He did a great job showing options for the new garage door openers, installing the selected new belt drive garage door opener/sensors and hauling away the old garage door opener. As estimated at the start he completed everything in 2 hours including programming the 2 remotes/keypad unit and the keypad unit installation"
"I caused a crazy accident with my double garage door. You guys came out on time and fixed it. Great job! know it works better then before!" "Very satisfied with the work performed, Gabriel is a true professional,explained what theProblem was and gave us an estimate. 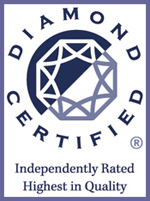 Did the job quickly and efficiently "
"The service provided was excellent. I would not hesitate to provide a referral to a colleague or acquaintance. Excellent articulation of the issues and very effective use of time. " "Mario did a great job and was timely to arrive and perform the work!" "chose you for same day service and local.our needs were met.yes, 5 star service from your phone rep and instsller Haziel.he installed new springs, realigned the right cable onto the roller and lubricated all moving parts (we were SHOCKED how quiet or door became! ).Haziel was courteous, professional, personable and FAST FAST!" "Got a broken tension spring and appointment setup was quick and easy.Mario (the super friendly and knowledgeable technician) contacted me promptly with his estimated arrival time. Mario explain the whole repair process and provided me with appropriate suggestions what should be replaced and what can be retained.After the repaired, Mario followed through iteration of tests and make sure everything is ok."
"I am so pleased that I chose Precision Garage Door to install my opener earlier this year. I needed a service call and John Chisgar was professional, educated and informative. I appreciated his customer service and felt confident with his repair. I was also pleased that with my work schedule they do have evening appointments." "You guys are very professional. Gabriel explained everything to me . He was a gentlemen and very considerate. He's a great employee. If I have problems in the future I will definitely use you guys again." "He fixed my Garage Door from going up and down all by it self." "The technician was very personable. A very good representative of your company. The service he performed was to just replace the battery in the outdoor remote key pad. It cost me $50. That is the most expensive battery that I ever bought. The worst part of it was that it was MY battery. But the technician was great. Like I said - a very good representative of your company. I WILL can on you again." 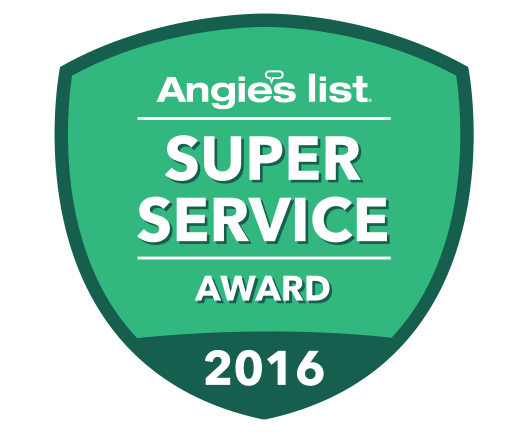 "Great service - fast garage door fix on a Sunday with easy communication. James W gave us an honest assessment of the problem and was able to fix the garage door quickly with tools and supplies from his truck for a reasonable price." "Broken spring on the roll up garage door. Gabriel was on a job in Suisun City that took longer than expected. He called to explain he'd be late, arrived after dark, gave us an estimate, proceeded promptly to repair the door (ended up replacing both springs and the end bearings). Much appreciate the good communication and after hours work ethic. "